Vivienne plunges into the burning laboratory to find survivors on Chapter 8 Page 23. I do love Vivienne. She’s such a fearless character. That often gets her into trouble. Anyway, to see what Vivienne finds, please vote for Snow by Night on Top Web Comics. Our Art Contest has an extended deadline – March 15. I’m thinking about giving artists even more fodder for consideration by discussing the planetary metals on Friday. The planetary metals are fascinating to me and could have all sorts of possibilities for the art contest. 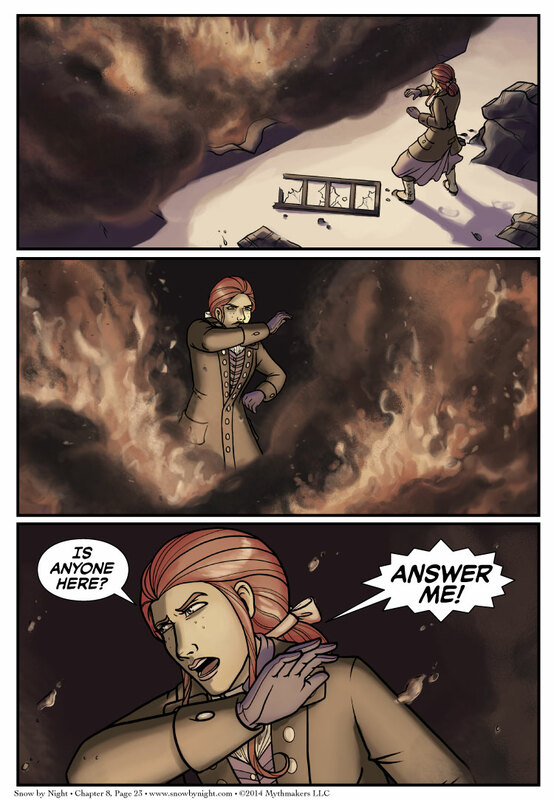 Jeez, from the preview for this comic, I expected Vivienne to be casting some sort of Ice Magic on the fire. Huh… I dunno. I see Viv more as a fire mage? Hm, unless the magic worked such that you can not so much create but control fire, meaning she could make it burn out faster, control where it does and doesn’t burn, etc.